Fast charge for Samsung Galaxy S9 / S9+ / S8 / S8+ / S7 / Note8 when using with QC3.0 car charger. Ensures a safe charging environment with overcharge, overcurrent, short-circuit, temperature control and other safety features. Special air vent mount make sure not heat up while charging. Provides and the fast charging speed 1.4time faster than standard wireless charging devices, offers you a quick charging speed, high conversion rate charging experience. Quick release button allow set up everything easily with one hand, press release button to open clip automatic, then insert or take out mobile phone. Press the arms to clamp mobile phone. Easy to operate. Holder grips and bottom bracket are made by silicone rubber, which is soft to protect your phone from scratching. This phone mount can be uesd as Phone Stand on Office/home/school. 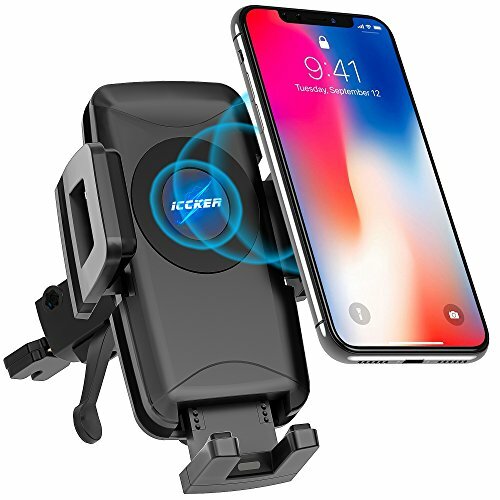 Intelligent Protect Technology: Qi wireless car charger mount is built-in IC chip provide voltage protection, over temperature protection, short circuit protection, making sure ultimate safety for your phone. One-hand Operation: Combines a phone holder and a wireless car charger. Simply slip your phone down, this wireless car charger would grips your phone securely and charge simultaneously, press release button on holder back, telescopic arm can extend from 1.9in to 3.6in, suit 4-6 inch phone. Spring Lock Secure to Air Vent: Phone Holder hooks to a blade of the air vent grille, metal springs increase grasp force, not just pushed in blades, prevent fall out meantime make sure not heat up while charging. All-Around Protection: Thicker arm stabilizer with strong adhesives allow for easy positioning, soft rubber padding & clamp anti scratches & damage. If you have any questions about this product by ICCKER, contact us by completing and submitting the form below. If you are looking for a specif part number, please include it with your message.